When you are bored, you will practice guitar less. Less time spent practicing guitar = slower progress. (In extreme cases) you may lose your passion for music/guitar and quit practicing altogether. Zero time spent practicing guitar = zero progress. Your practicing will become a lot more focused. To track progress, you must create short-term goals and work towards them. This gives you something to measure progress with and helps your guitar playing improve a lot faster. To see an example of how to do this, download this free report about increasing your guitar speed. You will compete against yourself. Tracking your musical progress every week is like keeping score in a game. Imagine playing a game and not keeping score… not very fun, is it? Yet this is how most guitarists (who don’t track their progress) practice guitar. When you get weekly feedback about how much progress you made in your guitar playing, you are motivated to continue practicing. When your practicing produces greater results, the process itself becomes more fun. When guitar practice is fun, you practice more…which leads to even more progress! You will become confident in your potential to become a great guitarist. Your attitude about your musical potential is the biggest factor that determines how good of a guitar player you will become. Step 1: Break down your musical goals into a list of specific skills you must practice and master (a great guitar teacher will help you with this). Step 2: Acquire the right exercises to develop those skills (and learn the right ways to practice them). Exercises can include physical things to play on guitar or specific topics to study/practice (such as music theory, fretboard visualization, aural skills, lead guitar phrasing, etc.). Step 3: Set specific short-term goals for each exercise that lead you towards your long-term goals. To understand how to do this, read this article about setting and reaching musical goals. Step 4: Practice your exercises for a set period of time (such as 1 week). Step 5: Test your progress towards your goals in Step 3. Use a metronome to do this with skills that are technique-related. For skills that cannot be measured with a metronome, find ways to assess your progress using specialized tests (more on this below). Step 6: Record your progress on a progress chart that you update every week. This is how you “keep score” in your guitar practicing. Learn powerful principles that that will transform your playing. Step 7: Adjust your guitar practice schedule (if needed) based on your progress. This will ensure that you continue improving your guitar playing every single week. Step 8: Repeat steps 4-7 for each short-term goal, until your long-term musical goals are reached. 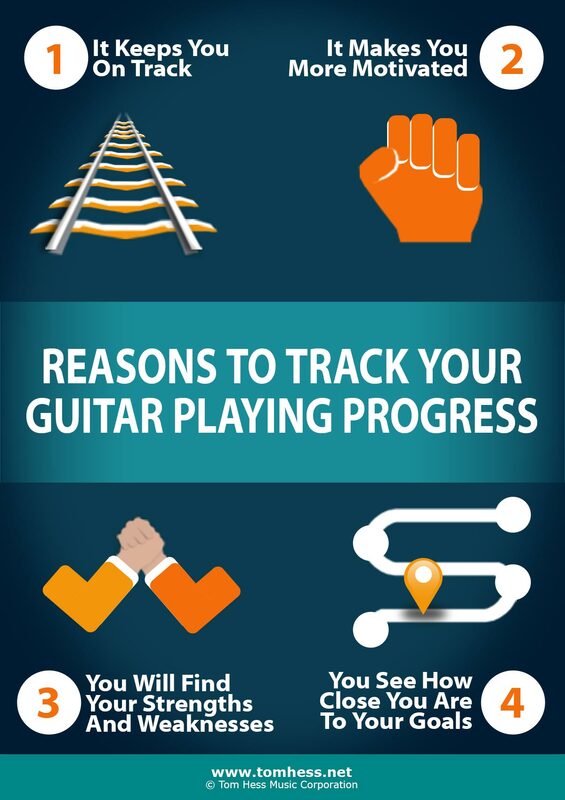 To make tracking your progress simple and fast, use a specialized tool that tracks your progress for you and gives you the best, most accurate tests for assessing every single aspect of your guitar playing. To learn how it works, read this page about speeding up your guitar playing progress. By consistently tracking your guitar playing improvement, you will reach your musical goals faster than you ever thought possible. To see an example of explosive results you can expect by following this process in your guitar practicing, download this free report about building your guitar speed. Learn how to accelerate your musical progress and become a better guitarist a lot faster.